Are you a stupid or corrupt franchisee? Language and the meaning of words change over time. 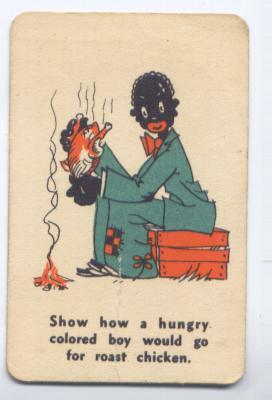 This is an antique card used in the game of charades. I don’t think that this was intentionally offensive at the time of printing. But over time, it would be deemed inappropriate, demeaning and maybe blatantly racist. Being a franchisee is rapidly becoming a target of derision in the public’s mind. a fool; a dupe in a rigged game. This entry was posted on Monday, June 28th, 2010 at 5:00 am and is filed under A Confidence Game, Language. You can follow any responses to this entry through the RSS 2.0 feed. You can leave a response, or trackback from your own site.